Walking by the water has always been cathartic for me. The beach is the place I have come for decades to mull over decisions, stretch my sights forward and seek the quiet whispers of answers to life’s mysteries. Today I spied a lone seagull watching me, observant, almost suspicious. Buoyed by my past successes by the sea, I returned the gaze with a brazen stare. But this day was different somehow. Instead of answers rising up, memories tumbled out, like my life was an overturned cup. Before me I glimpsed the young girl who dreamed of adventure, the mother who brought her babes to play along the shore at sunset and the woman who leaned into the warm kiss of her one true love while the ocean nodded in approval. Thinking of days gone by with the roar of the waters filling my ears, a ping of pain hit my heart like an arrow and I let the waves have their way with me. The vessel that held the happenings of yesteryear was being emptied, becoming vacuous and bare. Despite a blazing summer sun, a shower of primal green rain born of the blue sky appeared overhead. I had the sense I was being cleansed from above and below, purged, purified and prepared for what was yet to come. Walking and walking and walking some more, I had the thought that this practice was active rest, an oxymoron to some, a welcome respite to those who know the reverie the gulf has to offer. The current comes and goes with a liquid chant, creating a dreamlike humming that is heaven sent. My mind travelled to the edge of a metaphor likening the changing waters to life, twisting and turning me about, rising to grab and pull me under when I least expect, the tide taking me along a path of its own doing. I saw myself diving deep to bring back a gem of wisdom from the sea and cradle the insight like a pearl in the palm of my hand. Instead, I chose to sit and rest. I chose to allow the wind and the clouds and the sea to mesmerize me. Soon the cacophony gave way to silence in the soft center of my being. There I waited peacefully to become the next version of myself. 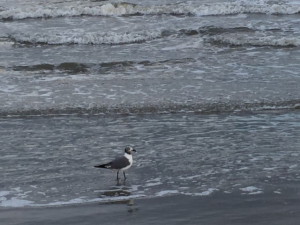 While I lingered in the stillness, the gull turned and looked back at me. With the sweep of a royal emissary, she flew off toward her destiny. What comes to you when you walk on the beach? A beautiful and powerful description of the nurturing, cleansing and healing power of the seashore. I’ve lived within an hour of the ocean for all but five years of my life and feel the tide drawing me to the edge of the sea often. Whenever I answer the call, no matter what time of year or what oceanside city I am in – worldwide, high or low tide, calm or rough, murky or clear, walking or just sitting in the sand, I find a sense of clarity, peace, insight, and….rest. Refreshed, I drag myself away, reluctantly, through the sand, and back to the chaos of life. My heart is warmed knowing you can relate Devoni. You have described your own experience beautifully. We are truly blessed with gifts from the sea.